Nodding Trillium Trillium cernuum L. 29 April 2012, Stroud Reseve, West Chester, Chester County, Pennsylvania. Another fairly slow day for birds, however, I did get three new arrivals, Red-eyed Vireo, Wood Thrush, and American Redstart. The high pressure that we have sitting over our region needs to move on so our birds can come home. I also didn’t get to check things as thoroughly today as I would have liked as I had to rush off to a doctor’s appointment. The up side to the nice weather is that the vegetation will be pretty full by the time things start to arrive in earnest. Trees like beech, maple and poplar are already pretty full. The oaks, hickories and ash still have a ways to go. I’m still adding many new plants to the preserve list and have quite a backlog of things to document. I have run into a small, no, actually a large disappointment so far with the plant inventory for the preserve. 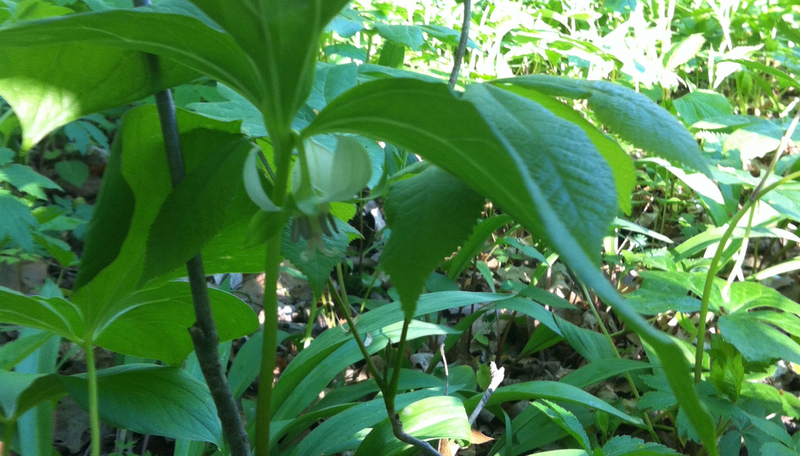 This time last year I found two specimens of the rare nodding trillium (Trillium cernuum). The day after the photograph above was taken the I went back to take a better picture of them but the plants had disappeared. I am assuming the cause of the disappearance was white-tailed deer foraging. I was excited to find these plants here because there are only 30-60 probable sites for its occurrence in Pennsylvania and an estimated population of only 5000-5500 ramets (i.e., clonal colonies). I have put a great amount of effort in checking the creek drainage where these plants were found as well as other suitable habitats on the preserve and have come up empty. If the plants are still growing on the preserve I should have another month or so until they wither away and can no longer be found. So if the Pennsylvania birding community could keep your fingers crossed, I’d greatly appreciate it! Barn Swallow – approximately 30, numbers seem to be climbing for this species. Gray Catbird – approximately 20, it is safe to say that the catbird factory is now in production! Bobolink – 1, heard only. I don’t know where the small group went that I saw earlier in the week has moved.